One must ask, how would this Order be constituted? For example, would they have snappy uniforms? This is not a frivolous question. Some kind of unified look seems necessary for the requisite unity of purpose, and simple identification as an Order by the the masses. And certainly, uniforms always seem to preoccupy Rightist groups. But while Hilter’s Brown Shirts and black SS were a hit in Germany, (due, as Evola would recognize, precisely to the remaining respect for traditional authority that made Central Europe seem recoverable) uniforms are quite problematic in Anglo-American society. Mosley’s Black Shirts were easily satirized, while various post-War American “Neo-Nazi” groups are widely ridiculed (“I hate Illinois Nazis! “). Indeed, in the context of Post War, “casual” America, uniforms are always bad, unless they partake of the democratic slob ethic. Thus, motorcycle gangs can wear ragged remnants of German uniforms, along with their piss-drenched “colors,” negroes seem to enjoy wearing full camo outfits in urban settings, and the various Guardian Angels, who are also largely figures of fun, dress like guidos in berets even in Texas. I believe Mark Ames once suggested a mass protest by people wearing Gap khakis and button-down shirts, during the Republican convention in New York City, to show that Bush’s opponents were not just the dirty hippies stewing in the “Free Speech Zones.” But really, this is the schlubby non-style of the cubicle rat, not fit for a vanguard movement. Yet he may have something there. Ironically, while the hippies officially celebrated the wild, “do your own thing” style of say, dressing like Sgt. Pepper, in practice they quickly devolved into the lazy, dirty, “crunchy” style of the jeans-and-t-shirt identikit, emblematic of the fact that for all their talk of “your own thing” they were actually a movement of fusion into a Dionysian indiscernibility (or “promiscuity” as Evola would say, a interesting term to use in the area of “free love”), exemplified by “Woodstock Nation,” orgies, “mass” protests, etc. However, maybe the Hippies had the right intuition. What did they sneer at as “uniforms”? Suits. Men’s business suits. And unlike jackbooted Nazis, not only merely acceptable, but even compulsory, at least at one time: the period of America’s Post War dominance. And in today’s Casual Friday world, the ultimate rebellion. This is not the place for a history of suits, which you can easily find. I just want to observe here that at one time, suits, though uniforms, could make statements, and even change history. Consider the JFK Look , two buttons, no hat: Youth! Or the Beatles tight collar-less look, itself derived (via the homosexual Brian Epstein) from the Teddy (i.e. Edwardian) Boys of the 50s; and, of course, the Lonely Hearts Club Band uniforms: Rebellion! Among other things, Kennedy banished hats for men, even disposing of the top hat for his inauguration speech. He also traded in the three-button suit for a baggier two-button style (to accommodate his back brace) and reintroduced the casual blue blazer both in the White House and on trips to Hyannis Port. Less well known is that for all the unselfconscious air that his wardrobe conveyed, J.F.K. went to the trouble of having much of it made by a tailor in London, a sartorial standard he had come to appreciate as the son of U.S. Ambassador Joe Kennedy and one that his wife Jackie and sister-in-law Lee Radziwill thought should be the natural beginning point for a man of style. In the Beatles pre-famous days, leather and cowboy boots were the order of the day. (In other words, fake British Cowboy nonsense, like Bush.) When Brian Epstein signed the boys he changed their image to fit in with their new tight sound. 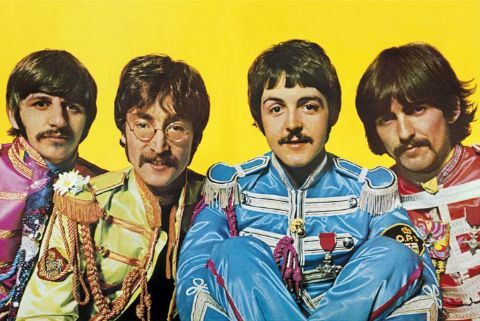 Their hair was cut in a shorter version on the now famous Beatle’s mop-top, and their old leathers changed for collarless tailored suits. 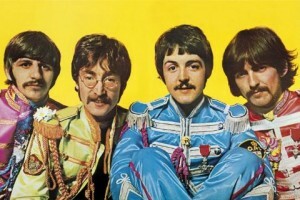 When the Beatles entered their Sgt. Pepper stage they were wearing psychedelic flared suits, army style jackets, and identical mustaches. There was a sense of freedom and unrealness about their new image which favored the times. After they had outgrown that look they outgrew their hair and beards and became fully fledged hippies. They wore Indian style clothes away on their meditation and relaxation trips, and jeans, shirts, and cowboy garb in their final days. (In other words, after they passed their prime they became dirty hippie slobs.) However, Ringo was notorious in his love for suits. All this is nicely summarized in the first chapter of Tom Wolfe’s The Electric Kool-Aid Acid Test  , titled “Shiny Black FBI Shoes,” where white-suited Wolfe (who informs the reader that in New York he is considered quite stylish) finds himself feeling threatened by Men-in-Black FBI agents, and at the same time feeling out-classed by a Merry Prankster in a colorful and be-medaled WWI era uniform. Where might we find vestiges of this be-suited rebellion today, to serve as models for our new Order? 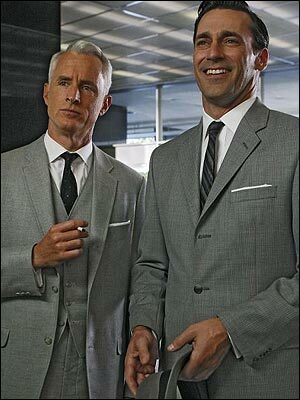 I submit, the popular TV show, Mad Men  . Of course, the various Mad Men are not themselves rebels. Quite the contrary, they are deliberately portrayed in their easy, taken-for-granted post-Kennedy, pre-Beatles period of dominance, which is exactly why they can serve as our model for the unselfconscious authority of the New Order. The Sopranos, the programme for which Mad Men’s creator Matthew Weiner worked as a writer before getting his own series, is often invoked by journalists as a godparent to the newer show. The two share a focus on the world of men, a primary relationship between an older, world-weary boss and a sneaky young turk, even a psychiatrist figure who pops up to allow a character to express what can’t be said at home. Unfortunately for Mad Men, the example of The Sopranos shows up all the possibilities of the medium that aren’t exploited in Weiner’s show. And unfortunately for Jon Hamm, James Gandolfini’s depiction of Tony Soprano shows the kind of man Don Draper might have been: someone in whom strength and weakness, allure and cruel cunning, were held in balance, through an alternation of authority, neediness and physical violence. I suggest that the immense popularity of both The Sopranos (what a sissy name!) 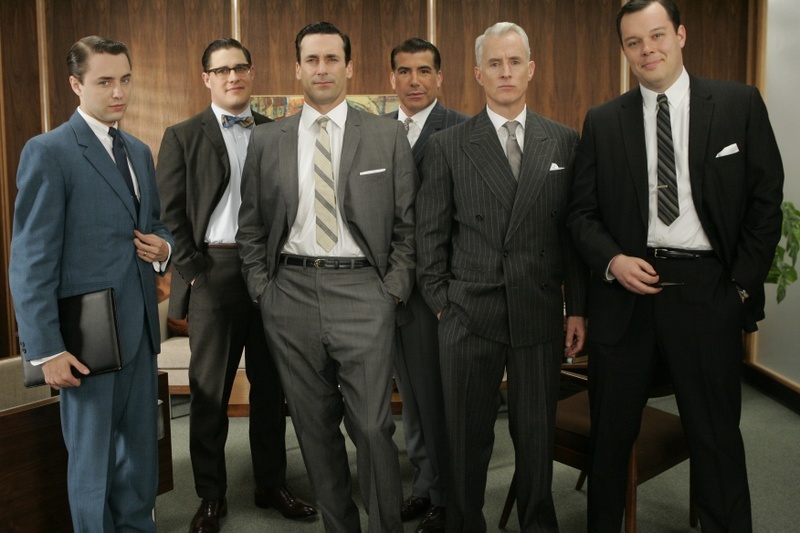 and Mad Men is both a symptom of the vaguely felt need for an elite Order in our society, whether it be found in Mad Men or mobsters (snappy dressers, and from Evola’s Sicily! ), as well as a suggestion for how to begin to proceed to reconstitute one. 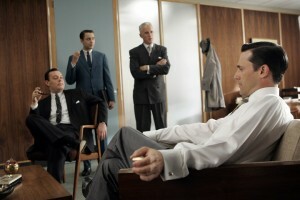 Although, sartorially, I certainly hope the Mad Men model prevails over the Goodfellas look. The fact that apparently there’s a whole bunch of women behind the show trying to bring down patriarchy is itself evidence of the matriarchal/social vs. patriarchal/state dichotomy that Evola is working from. One aspect of the Männerbund is a masculinist homoeroticism if not necessarily homosexuality, and while The Sopranos seemed to have a hard time handling that (whacking one outed character and having Tony’s son chose a series of queer careers, like event planning and film intern), Mad Men has a more interesting texture. One character is closeted (although we are supposed to congratulate ourselves on seeing how obvious he is), one rather minor one is open and mocked; while last week we find that the odious Pete Campbell is not only a wimpy, weaselly little guy (the “sneaky young turk” of Greif’s description) who would be typed as “gay” in our MTV-thug culture, but he also can dance, and you know what that means. (By “can dance” I mean knows how to do some old time White people dance, not the negroid twitching Evola mocks.) Additionally, the one female copywriter gets stoned and seems to be coming on to her middle-aged secretary; this might explain why she was attracted to Campbell. Since the first episode has Draper mocking Freud, is it possible that Otto Weiniger, if not Hans Bluher, is punching up the scripts?